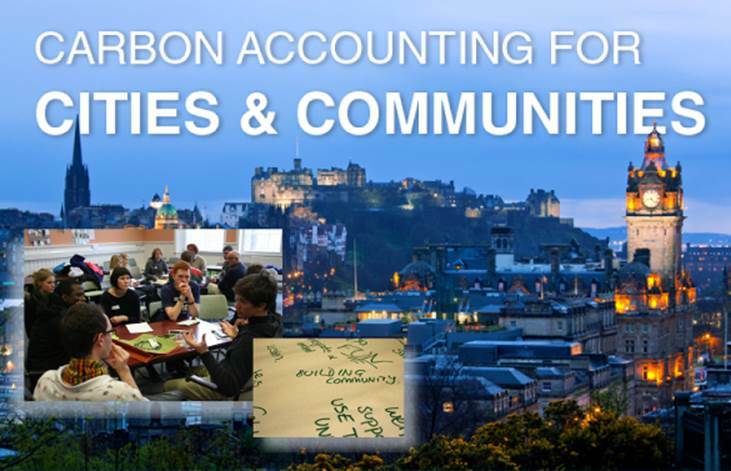 The Initiative for Carbon Accounting (ICARB) warmly invites you to our 2014 conference on Carbon Accounting for Cities and Communities on the Friday 5 September 2014 at the City Chambers, Edinburgh. It will be the key opportunity to learn from, and network with, leaders in the field of carbon management and accounting for communities. Join us to find out about the latest carbon accounting tools, what’s changed in the sector, and to meet community groups from across Scotland who are tackling the challenges of carbon accounting in their local areas. The conference will bring together many of the people involved in carbon audits for buildings, micro-grids, communities, towns and cities – from experts to accounting novices. It will examine the approaches and methods being applied, where improvements can be made, and how to overcome barriers to more correct and relevant accounting. Learn how to use the latest tools in carbon accounting with lessons learned from practice around the world. Meet practitioners using carbon accounting methods at the community level. Make connections with expert organisations and companies who are leading on carbon management. Register now at www.icarbconference.org. Exhibitor registration is also available for organisations interested in having a display or stall. For more information contact Sue Roaf on enquries@icarb.org. iCARB hopes you can join us for a stimulating day of learning and knowledge exchange at the forefront of carbon accounting in Scotland. We look forward to seeing you soon.